Preheat oven to 350°F. 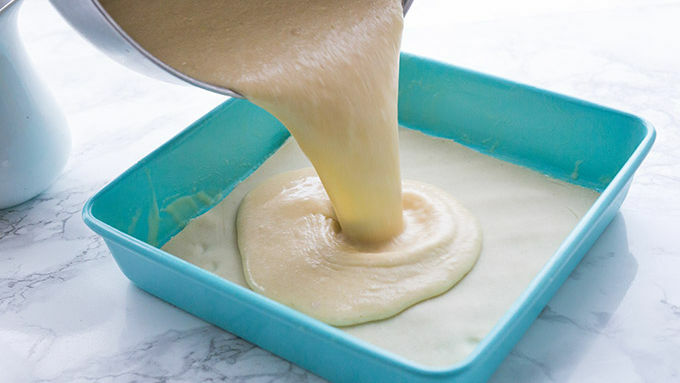 Grease an 8 x 8-inch baking pan with nonstick baking spray. Unroll pie crust and line the bottom of the pan with it. 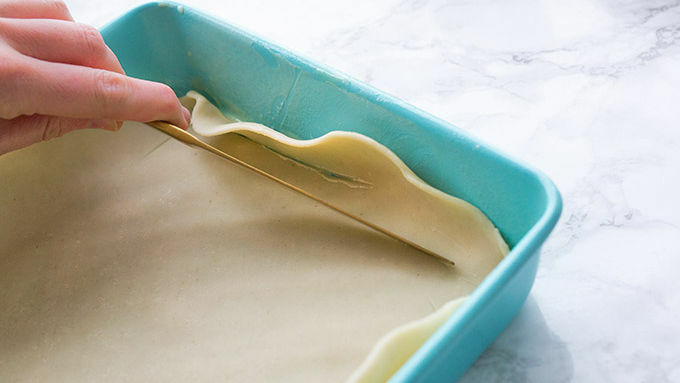 Use a sharp knife to gently remove the edges, so the pie only lines the bottom of the pan. In a stand mixer, combine the eggs, sugar and butter, creaming until light and fluffy. Add vanilla, flour and milk. Mix until combined and pour into crust. Bake for 40 minutes. 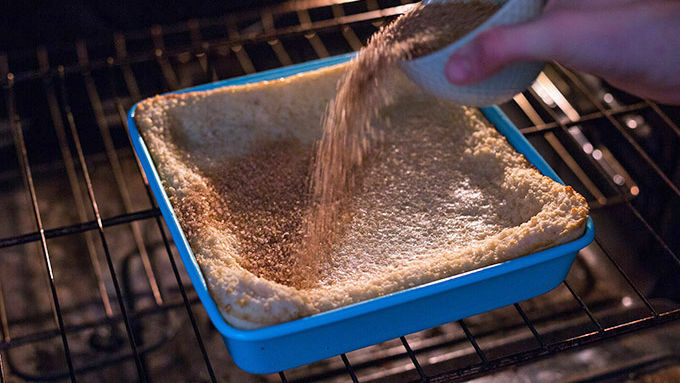 Carefully open the oven and sprinkle a layer of cinnamon sugar over the top of the bars. Return to oven and bake 15-20 minutes more, until the center is set. Allow to cool completely before slicing into bars. Enjoy! Mexican vanilla will add a slight cinnamon flavor to the filling, but if you can’t find it at your store, you can substitute regular vanilla extract. I once went on a diet where I ate only salads and crème brûlée. I wouldn’t recommend this as a viable eating approach. But I tell you that to prove that crème brûlée is my bae. And so, when I tell you that these bars are JUST AS DELICIOUS as a ramekin of that creamy, caramel-topped custard, you can rest assured: they are. Making these dessert bars is awesomely easy. Line a baking sheet with pie crust, top with a simple Mexican vanilla-spiked custard batter. Bake, then top with cinnamon sugar and allow to caramelize for a few minutes before pulling from the oven. The end result is a splendidly sweet brûlée bar. Perfect for pairing with horchata…or RumChata™, if you so please. Whether you try these bars because you love crème brûlée, or have mad cravings for churros, you’re about to be delighted by this dessert. I once went on a diet where I ate only salads and crème brûlée. I wouldn’t recommend this as a viable eating approach. But I tell you that to prove that crème brûlée is my bae. And so, when I tell you that these bars are JUST AS DELICIOUS as a ramekin of that creamy, caramel-topped custard, you can rest assured: they are. 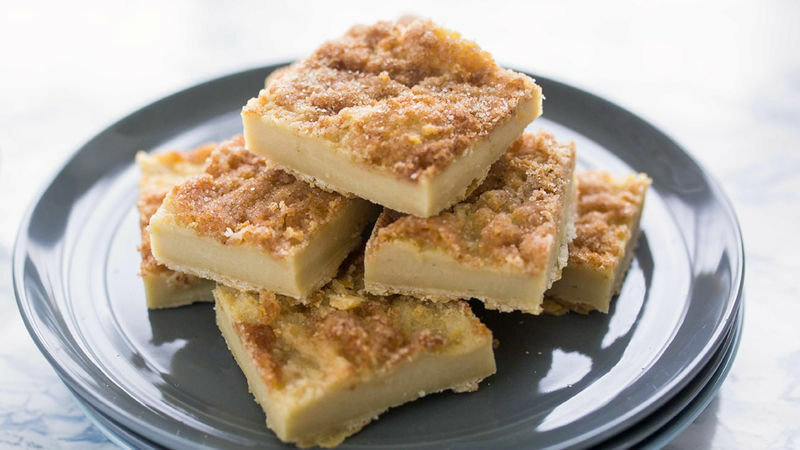 Making these dessert bars is awesomely easy. Line a baking sheet with pie crust, top with a simple Mexican vanilla-spiked custard batter. Bake, then top with cinnamon sugar and allow to caramelize for a few minutes before pulling from the oven. The end result is a splendidly sweet brûlée bar. Perfect for pairing with horchata…or RumChata™, if you so please. Whether you try these bars because you love crème brûlée, or have mad cravings for churros, you’re about to be delighted by this dessert.